Quick Post: I just had to try this when I saw it. I’ve been looking for creative ways to make healthier breakfasts lately and I thought this would be a fun one to try. This recipe has it all – protein, fiber, healthy carbs, healthy fats – there is so much going on. I might even convince the kids to try this because it’s so different and I would feel good about giving them something that’s not their preferred sugary cereal. Thanks for reading, enjoy! Other options: add nut or seed butter or in place of the preserves, shredded coconut, replace cottage cheese with high-protein Greek yogurt, sprinkle with cinnamon, raisins, other fresh fruit, goji berries etc! 1. Place two banana halves in serving dish or bowl. Add scoops of cottage cheese on top of banana. 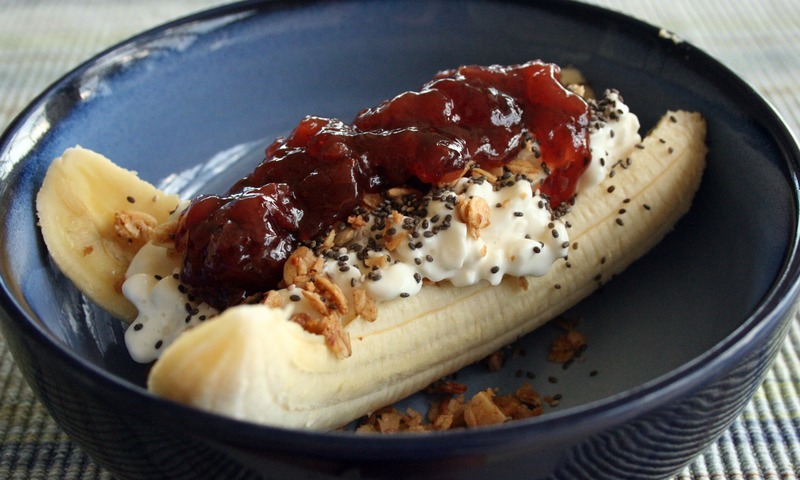 Drizzle with fruit preserves and garnish with flax, chia and chopped nuts. Looks like a bloody amazing breakfast! It was tasty, but next time I’ll use honey or less preserves. Love the addition of granola 🙂 looks delish! !